Mark's Tickets is the best place to find tickets for Atlanta Hawks fans. Just check this page for any new events or schedule updates throughout the year. We sell tickets to every Atlanta Hawks game around the world. We know how passionate Atlanta Hawks fans can be about basketball, so we make sure to have hundreds of tickets for every game available right up until it starts. For those looking for cheap Atlanta Hawks tickets, we offer tickets starting at very low prices (many times below face value). We offer tickets in most sections of every venue that you can see Atlanta Hawks. Simply choose the city or venue that you are interested in below, and you will be able to see all of the available seats. Do not forget that Marks Tickets also specializes in sold out Atlanta Hawks tickets. No longer will sold out shows prevent you from seeing Atlanta Hawks. The Atlanta Hawks are a professional basketball team that plays in the NBA. 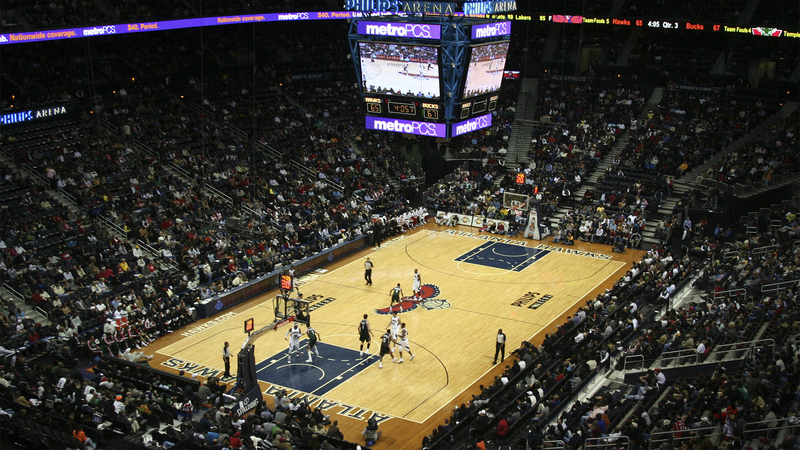 The Hawks play their home games at Philips Arena in Atlanta, Georgia. With 82 games per year, and 41 being home games, The Atlanta Hawks are an American professional basketball team based in Atlanta, Georgia. They are part of the Southeast Division of the Eastern Conference in the National Basketball Association (NBA). They play their home games at Philips Arena in Downtown Atlanta. Their origins can be traced to the establishment of the Buffalo Bisons in 1946, a member of the National Basketball League. After 13 games of their inaugural season, the team moved to Moline, Illinois and became the Tri-Cities Blackhawks. In 1949, they joined the National Basketball Association (NBA) as part of the National Basketball League and the Basketball Association of America merger. In 1951, the team moved to Milwaukee, where they changed their name to the Hawks. The team moved again in 1955 to St. Louis, where they won their only NBA Championship in 1958. The Hawks moved to Atlanta in 1968, where they have been ever since. The Hawks currently own the second-longest run (behind the Sacramento Kings) of not winning an NBA title at 54 years. All the franchise's NBA Finals appearances and lone NBA championship took place when the team resided in St. Louis. Meanwhile, since the elimination of first-round byes in 1967, they have not advanced beyond the second round in any playoff format. Much of the failure they've experienced in the postseason can be traced back to their poor history in the NBA draft. Since 1980, the Hawks have drafted three players who have been chosen to play in an All-Star game (Doc Rivers, Kevin Willis, and Al Horford; Dominique Wilkins was actually selected by the Utah Jazz and traded to the Hawks a few months after the draft). Horford is the only All-Star Hawk to have been drafted since Willis was selected in 1984, and is also the only first-rounder the Hawks selected in their nine-year playoff drought to play in an NBA All-Star Game.